Watch the butter fly off the shelves: It's the worst butter shortage in France since World War II. For the past couple weeks, the butter shelves at supermarkets throughout the country have been getting emptier and emptier. And the emptying process seems to be speeding up as people start to stockpile butter in their freezers. After all, Christmas isn't that far away. I've already mentioned that in France, bread and butter don't go together like, well, bread and butter, because the French rarely butter their baguettes. But that's when the bread is fresh and sliced for sopping up your dinner sauce. When it's toasted, or sliced in a long tartine (sandwich style slice) for breakfast, it wants butter. And what about the butter for everything else -- the sauces, the sautéeing, the escargots? The French need their butter, and at the moment, they're not getting much of it. Pastries will be hard hit, especially the kouign aman, pictured below, which is essentially butter held together with a pinch of flour and handful of sugar. Not to mention choux puff pastries and butter croissants. Indeed, without the requisite amount of butter, how will the French butter their sandwiches? For oddly, though they eat their dinner bread without butter, as soon as they make the baguette into a Camembert (or other cheese) sandwich, they also add butter. Yes, this is quite redundant. No, we've never figured out why. Yes/no, it's both delicious and repulsive, depending on how much you think about it as you eat. The butter shortage seems to be caused, in turn, by a milk shortage arising from the abolition of milk quotas in 2015 by the European Union. Because of the change, at first there was too much milk flooding the system (pardon the pun), which made the prices collapse which, in turn, led to dairy farmers lowering output. At the same time, worldwide and nationwide demand for butter has been rising. Combined, that has also caused butter prices to nearly triple in just a year -- from 2,500€ per metric ton (1,000kg) in April 2016 to 7,000€ per metric ton in summer 2017. Bakeries and restaurants are either raising their prices or lowering output (and, therefore, cutting employee hours). And yes, if the problem is the milk supply, then it will also be felt in the cheese market soon. To you it may just be butter, but the people of France are starting to suffer: They feel like the bread does, indeed, always fall buttered-side down. Metsi is a raw cows' milk cheese made in village of Métabief, in Haut Doubts, in the Bourgogne-Franche-Comté region, by the Fromagerie Sancey Richard. The village is located in the Jura mountains, just by the Swiss border. Fromagerie Sancey Richard is a family business started by Maurice Sancey Richard in 1961, then continued by his wife Alice and two sons in 1981 upon his death, and the two sons alone after Alice's retirement in 2011. It's a real family affair, with the remaining daughter and son joining in when they expanded the business in 1989. And now with the third generation, Eddie and Virginie. Generally, they transform 3 million litres of milk annually into cheese with 10 employees. 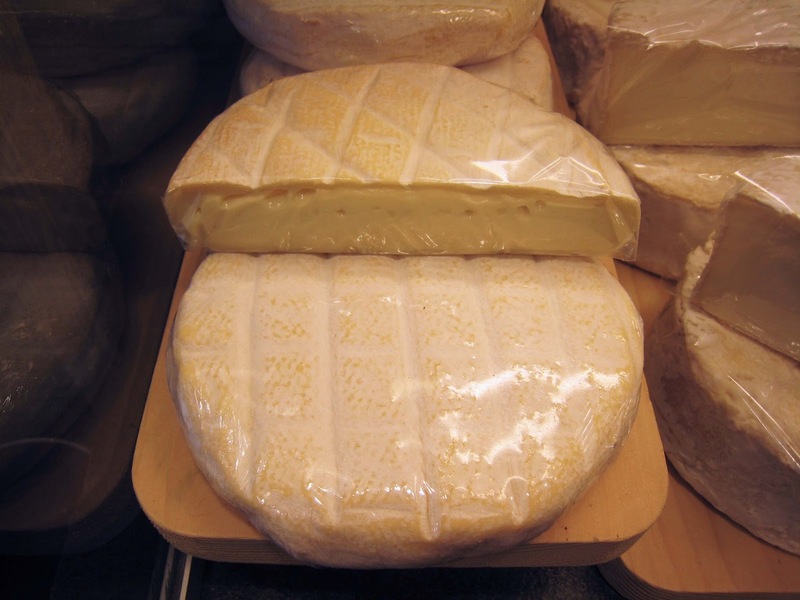 Metsi is a "pâte molle" cheese -- meaning a soft dough cheese. That means it has some serious oozy potential, a buttery, unctious texture in the middle, held together with a lightly washed crust that gives it a slightly pungent character -- in a good way. There are definite hints of grass and a sort of sweetness to the stinkiness. When pulled out of the fridge cold for a photo op, however, it can be very solid indeed. It's made year round (when the milk supply holds out, that is) and the name originates with the "Met" from Métabief. At my most recent sighting, Metsi cost 26€ per kilo. But the price may well go up, significantly, depending on the severity and duration of the milk shortage. 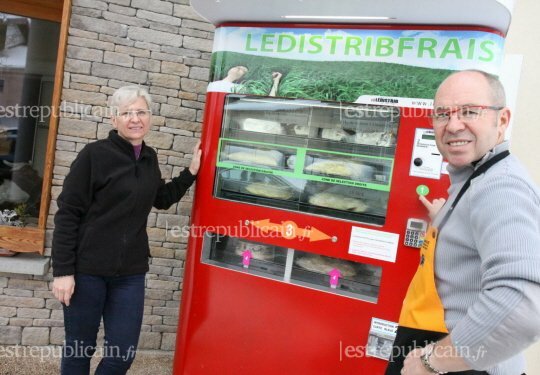 That will affect not only prices at the local stores and few Paris sales outlets, but also at the cheese vending machines installed in the villages of Métabief and nearby Jougne for 24-hour per day cheese-need-emergencies. If there's a butter shortage, you would do very well to spread this buttery, creamy, luscious cheese on your bread instead, though I don't recommend using it to replace the butter when baking pastries. Luckily, as a small artisanal cheese, Metsi's manufacture is not dependent on huge industrial milk providers. However, that doesn't mean that the price won't go up (and even supply down) as the shortage hits the dairy industry overall. And that stinks, much more than the Metsi does, because I want the butter -- and cheese -- and the money to pay for my butter, too.